Migration across borders is changing our prison populations. Lucy Slade has previously worked as a resettlement mentor manager and has volunteered in London prisons where a large proportion of inmates come from outside the UK. At Lucy’s local prison, HMP Wandsworth, around half of the prison’s 1,600 men are foreign, representing over 70 different countries. Because of language and cultural differences, these men are often isolated and less likely to be able to access rehabilitation activities. Keen to discover whether other countries could offer an alternative approach, Lucy was awarded a five-week Winston Churchill Travelling Fellowship in 2015, in partnership with the Prison Reform Trust. She travelled to the Netherlands, Spain, Norway and Sweden, visiting countries that have a high or growing proportion of foreign prisoners in their prisons. Over a third of prisoners are in Norwegian prisons are foreign. The majority, around 70%, do not have a valid social security number and it is assumed that they have little or no social connection to Norway. Norway’s economic downturn is also said to have contributed to the growing numbers. Non-Norwegians, previously employed in building projects, are now out of work and have resorted to burglary or theft to make ends meet. A large number foreigners in Norway are remanded or sentenced for crimes related to trafficking of drugs. Norwegian prisons are crowded, operating at 97% of their capacity, and the process of deportation is slow. For foreign prisoners the most basic resources are unavailable in their own languages and they are excluded from almost anything that will help them lead a life that is crime-free. But in this bleak landscape there were examples of good practice which stand out, usually because of the work of outstanding individuals like Yury Zelentsov and the chaplains of ‘Safe Way Home’, a resettlement programme for prisoners facing deportation. It is unique to Norway, part funded by the Norwegian government and supported by the Salvation Army’s network in 127 countries. Yury was first drawn to foreign prisoners because he saw their isolation in Norwegian prisons. His language skills were much needed by the Eastern European population – he speaks Russian, English, Finnish and Norwegian. He tries to start his conversations with prisoners early in their sentence. The emphasis is on the prisoner’s willingness to change and take responsibility for themselves. The success of Safe Way Home hinges on an agreement with the Norwegian immigration police. Information about the departure date and flight times are shared with Yury though not with prisoners. He is then in able to ensure that paper work is in order thus avoiding further detention in an immigration centre. During this time the prisoner may feel very uncertain but will be told that everything is taken care of. 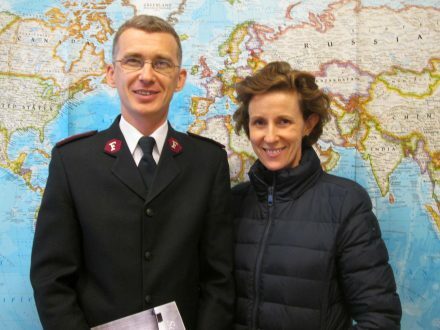 Prison chaplains continue to visit once a week until departure. Yury is always at the airport in order to say good bye and, when appropriate, following the man or woman onto the plane and giving them food for the journey. Timing is important too. If the plane is delayed by a few hours the person may arrive in the middle of the night with no one to meet them. Photo: Yury Zelentsov and Lucy Slade. what a brilliant scheme ~ nice to hear that some people can be bothered to do such things. This is a wonderful programme. Could you please send me an email address for Yuri Zelentsov. He was on my staff when I was in St Petersburg in 1993. I was delighted to see his photo with Lucy Slade. David..Yuri is on Facebook you could make contact that way.Betty moncrieff and myself have kept in touch with him since she was in St Petersburg setting up the Home Help service…perhaps you will remember her? Lucy Slade has previously worked as a resettlement mentor manager in London prisons, where a large proportion of inmates come from outside the UK. She also has experience of working in prisons as a volunteer.